One package $7.50 or three or more packages for only $7.00 per package! The scent of lavender is relaxing, calming and soothing. Just toss one of these bags into a dryer full of wet laundry and dry as usual. 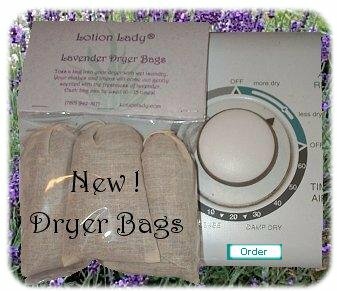 Your clothes and linens will come out gently scented with the freshness of lavender! Each package contains three bags and each bag can be used between 10 and 15 times. You can also put them in your dresser drawers.